Disney Cruise Line offers guests of all ages a memorable cruise experience aboard its family-friendly ships. With ship names like “Disney Dream,” “Disney Fantasy,” and “Disney Wonder,” you can expect touches of the Disney magic throughout the entire cruise. The fun starts on day one, when Disney characters, the ship’s crew, and everyone on board joins in a dance party on deck. Staterooms are designed especially for families and offer comfortable and fully appointed accommodations. Disney cruises sail to many destinations around the world. California cruises travel from San Diego up the coast to stops in San Francisco and Vancouver, or south to Ensenada, Mexico. 7- and 9-night cruises to Alaska depart from Vancouver and tour its beautiful glaciers, seascapes, and mountains. Cruises to the Caribbean are among the most popular of Disney Cruise Line’s offerings, with several itineraries from which to choose. Ports-of-call on Caribbean cruises include Key West, Grand Cayman, Antigua, St. Lucia, Barbados, and Jamaica. Bahamian cruises depart from Port Canaveral or Miami, Florida, and stop in Nassau and Key West. Some cruises stop at Castaway Cay, Disney’s own island port-of-call reserved exclusively for Disney Cruise Line guests. Disney cruises also sail to northern Europe, the Mediterranean, through the Panama Canal, as well as on transatlantic cruises. 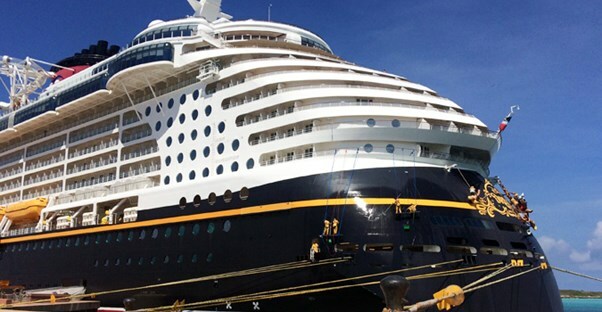 Once in port, guests can enjoy shore excursions through Disney’s Port Adventures. These excursions are specially selected by Disney and include sightseeing and recreational activities. Disney cruises provide several different types of fun and engaging activities just for kids. There are live stage shows featuring original Disney musicals, as well as movies shown on the big screen. Kids will have the chance to meet costumed characters like Mickey Mouse and Donald Duck during meet and greets and autograph sessions. There are various themed youth clubs where kids of all ages can enjoy a variety of activities and games. All of the ships have pools for the kids with water slides, play areas and quieter areas for the little ones. For adults who want a little down time for themselves, Disney cruise ships offer night clubs and lounges featuring live music and cabaret shows, spa and fitness facilities, and art galleries. Fine dining is offered aboard each ship at Palo, an adult-exclusive restaurant serving Northern Italian cuisine for dinner. While parents enjoy time alone, kids can participate in one of the youth clubs under the supervision of a trained counselor. All of the ships also provide supervised care in nurseries for young children age 3 months to 3 years. No matter which Disney cruise you choose, it will be a fun experience for the entire family.